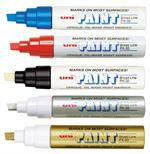 Are you on the lookout for high-end markers for your business or personal needs? 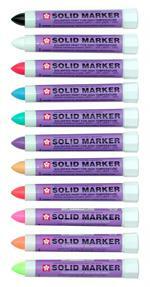 Markers 4 U, Inc., is proud to provide you with a huge array of high-end selections. Whether you are looking for quality paint markers for an indutrial application, an art project or need Sharpie permanent markers for your business needs, our business has a wide selection of great products. Brands include Sanford paint markers, uni-Paint markers, uni-Posca markers, Mean Streak markers, as well as Sakura solid markers, Zig Woodcraft selections, and trace elements certified markers. When you shop online with us, you’ll gain access to some of the world’s best markers at prices that are way below the list price. This means that when you buy paint markers in bulk, you’ll be able to get these products at prices that will fit your budget! 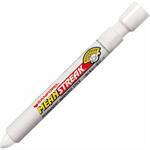 Shop our selection of Sharpie permanent markers or uni-Paint markers and place an order online today. Available in 15 bold, weather resistant, fade proof colors. Pointed tip is approximately 1/8" in diameter. Sold here individually. Also sold in 6 and 12 multicolor sets.